First To Discover The Antarctic? 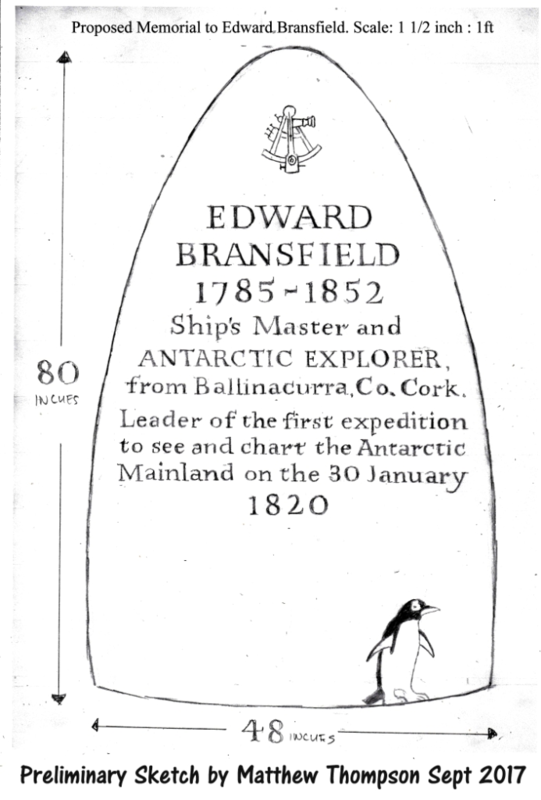 One of our aims is to place a monument to Bransfield in his birthplace of Ballinacurra, Cork in January 2020 to commemorate the 200th anniversary of his achievement of making the first sighting of the Antarctic continent. After many months of research, discussion and debate, the committee agreed the wording for the monument and a design submitted by renowned local sculptor Matthew Thompson. In November 2018 we signed a contract for the monument with Matthew. In addition, Cork County Council generously offered to develop an excellent site for the monument on Lower Road, at the entrance to Ballinacurra village which we will be renamed Bransfield Park. 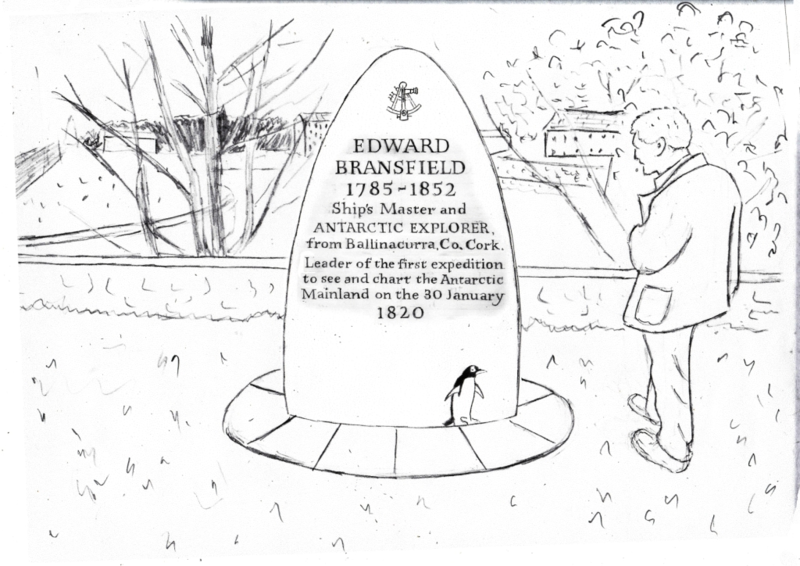 We will be unveiling the monument on the 25th January 2020, just five days prior to the 200th anniversary of Edward Bransfield’s expeditions sighting of the Antarctic mainland for the first time. 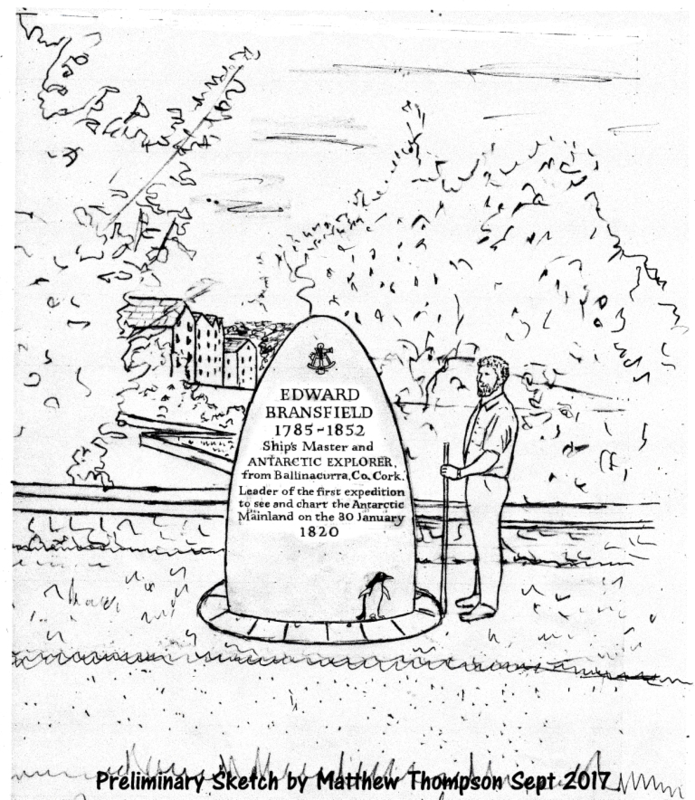 ‘My idea for the memorial to Edward Bransfield was inspired by the fact that he was a ship’s master who was in charge of the safe navigation and sailing of his ship. 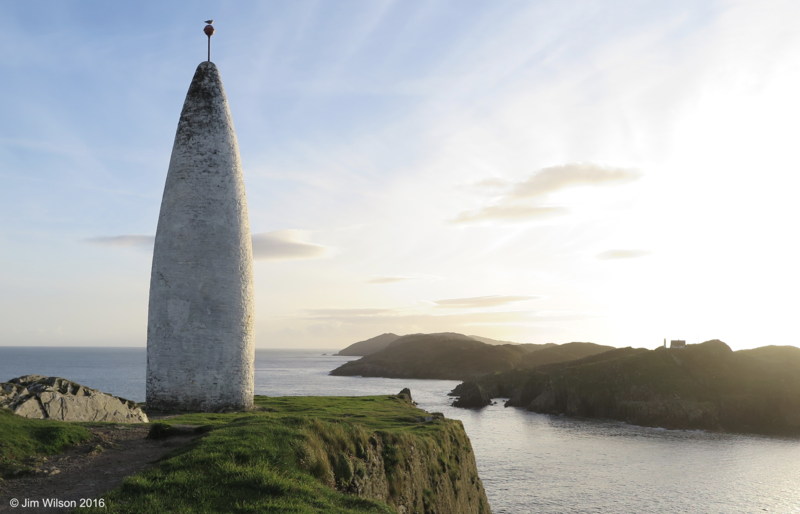 The shape of the memorial is inspired by navigation markers or beacons built by sailors and fishermen to mark the entrance to safe harbours, such as the beacon in Baltimore, West Cork. These would be lined up with other features in the landscape to show you the way in through the entrance to the bay. This is not always clear when you are at sea and seeing a navigation beacon is always a relief. This idea is also appropriate for the position of the memorial near the old harbour of Ballinacurra where Bransfield would have sailed as a young man fishing with his father. It is fitting for a navigator to have a navigation marker, a marker of a safe harbour, as his memorial in the town of his birth where he learned the skills to enable him to work his way up through the ranks to become a ships master. As I was working on this idea I was also reminded of stories of sailors who stopped on a deserted island where they were taking on water and who left mail under a prominent rock to be collected by the next passing ship. As a ships master, one of the tools used most by Edward Bransfield would have been a sextant. He would have used this to find out his position to navigate the ship safely and to chart the new unexplored coastline of the Antarctic mainland he discovered. For this reason I have added it in the design at the top of the stone. It is also a very evocative image of the sea, adventure and the unknown. For fun and an instantly recognizable symbol of the Antarctic I have included a penguin. This will excite interest and impart some information as to what the memorial is about instantly and from a distance. It should also make the piece more accessible to children. The lettering on the stone will be hand drawn and hand cut, v-cut letters in the traditional way which makes for a more elegant and beautiful letter. The lettering is the most important part and the whole reason for the sculpture and so time and attention should, and will be given to it to make it as beautiful and well placed on the stone as possible. I have drawn the lettering on the memorial to follow the shape of the stone, each line slightly longer than the last one as I think this makes the lettering one with the shape of the memorial.